The Federal Motor Carrier Safety Administration (FMCSA) announced Friday, December 21, to grant petitions preempting interstate motor carriers from the State of California’s meal and rest break rules, which differ from the federal hours-of-service regulations. FMCSA granted a petition filed in September by the American Trucking Associations and the Specialized Carriers and Rigging Association. Under California requirements, an employee is entitled to a 30-minute meal period after five hours of work and a second 30-minute meal period after 10 hours of work. In addition, employees are entitled to a 10-minute rest period for every four hours worked. FMCSA said more than 700 public comments were submitted to the Federal Register docket regarding the petitions. In 1996, Congress preempted states from enacting or enforcing policies “related to a price, route, or service of any motor carrier.” In this decision, FMCSA concluded that the meal and rest break laws provided no additional safety benefit and that a safety issue also existed because of limited parking in California, requiring drivers to take breaks in unsafe locations. The Pipeline and Hazardous Materials Safety Administration previously granted an exemption from the National Truck Tank Carriers to preempt its drivers from the California law in September. 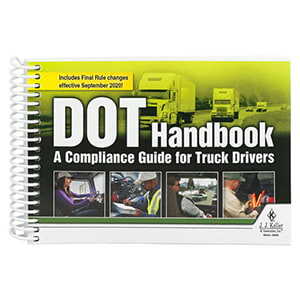 J. J. Keller's DOT Handbook: A Compliance Guide for Truck Drivers provides newly hired drivers with easy-to-understand, concise DOT compliance information.